The overview tab provides a summary of the imported log file data, based upon the chosen time period and user-agent(s). These can both be configured in the top right hand corner. While this data can’t current be exported, the tabular data can be copied and pasted and the graphs will need to be screenshot. Unique URLs – The number of unique URLs in the log(s). Unique URLs per day – The average number of unique URLs in the log events per day. Total Events – The total number of log events. Events Per Day – The average number of events per day. Average Bytes – The average bytes of all log events. Average Time Taken (ms) – The length of time taken (measured in milliseconds) to download the files on average. Errors – The number of events with errors (4XX or 5XX responses). Provisional (1XX) – Number of events with with a provisional response code. Success (2XX) – Number of events with with a success response code. Redirection (3XX) – Number of events with with a redirect response code. Client Error (4XX) – Number of events with with a client error response code. Client Error (5XX) – Number of events with with a server error response code. Matched With URL Data – The number of log file URLs matched against ‘Imported URL Data’. You’ll need to import URL data for this not to be a ‘0’. Not In URL Data – The number of log file URLs not matched against ‘Imported URL Data’. You’ll need to import URL data for this not to be the same number as ‘unique URLs’. If you have imported crawl data, these could be orphan URLs for example. Not In Log File – The number of ‘Imported Data URLs’ not matched against log files. You’ll need to import URL data for this not to be a ‘0’. If you have imported crawl data, these could be URLs that have yet to be crawled for example. The URLs tab aggregates the log file data for every unique URL discovered, based upon the chosen time period and user-agent(s). These can both be configured in the top right hand corner. URL – The URL discovered. Last Response Code – The last response code from events. Content Type – The content type is guessed from the file extension, as it’s not provided in a log file and there is no crawling involved. So it’s not from the HTTP response. Hence, these will not be completely accurate, merely a best guess at this stage. Average Bytes – The average size in bytes of all log events for the URL. Average Response Time (ms) – The length of time taken (measured in milliseconds) to download the URL on average. Num Events – The total number of events for the URL. All Bots – The total number of bot events for the URL. Googlebot – The total number of Googlebot events for the URL. Bingbot – The total number of Bingbot events for the URL. Googlebot Mobile – The total number of Googlebot Mobile events for the URL. Googlebot Smartphone – The total number of Googlebot Smartphone events for the URL. Yandex – The total number of Yandex events for the URL. Baidu – The total number of Baidu events for the URL. This tab aggregates response code data from the log file for every unique URL discovered, based upon the chosen time period and user-agent(s). It shows the last response code, the time of last response and the number of log events for every URL. It also groups events by response codes buckets, 1XX, 2XX, 3XX, 4XX and 5XX, so you can quickly see an overview of all responses for the time period you’re analysing. Time of Last Response – The latest response time from the events. Inconsistent – This is true or false. True means the URL has inconsistent response codes from all events analysed. So if a URL had two events, one was a 200 response and the other a 404, this would be ‘true’. If both responses were 200, then it would be ‘false’. 1XX – The total number of 1XX events for the URL. 2XX – The total number of 2XX events for the URL. 3XX – The total number of 3XX events for the URL. 4XX – The total number of 4XX events for the URL. 5XX – The total number of 5XX events for the URL. The user-agents tab aggregates data from the log file for every user-agent discovered, based upon the chosen time period, user-agent(s) and project type (‘Bot only’, or ‘All’). User-Agent – The specific user-agent of the event. Unique URLs – The number of unique URLs with events. Num Events – The total number of events for the user-agent. Average Bytes – The average size in bytes of all log events for the user-agent. Average Response Time (ms) – The length of time taken (measured in milliseconds) to download URLs on average for the user-agent. 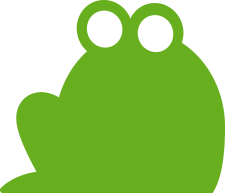 1XX – The total number of 1XX events for the user-agent. 2XX – The total number of 2XX events for the user-agent. 3XX – The total number of 3XX events for the user-agent. 4XX – The total number of 4XX events for the user-agent. 5XX – The total number of 5XX events for the user-agent. The Referer tab aggregates data from the log file for every Referer discovered, based upon the chosen time period, user-agent(s) and project type (‘Bot only’, or ‘All’). The Referer comes from the Referer header field in the HTTP request. It identifies the web page that linked to the page being requested. Referer is not a mandatory field, so it maybe that this was not included in your imported log files and this tab has little value to you. If the imported log files did have Referer information in them, it will very probably not be included in every event as it’s an optional field. Depending on log file type the Referer will either be shown as empty or “-” when missing. Logs events from search engines, or users visiting pages directly will typically not have any Referer information in them. Referer – The referer URL of the event. Unique URLs – The number of unique URLs with the referer. Num Events – The total number of events for the referer. Average Bytes – The average size in bytes of all log events for the referer. Average Response Time (ms) – The length of time taken (measured in milliseconds) to download URLs on average for the referer. 1XX – The total number of 1XX events for the referer. 2XX – The total number of 2XX events for the referer. 3XX – The total number of 3XX events for the referer. 4XX – The total number of 4XX events for the referer. 5XX – The total number of 5XX events for the referer. The directories tab aggregates the log file data by directory path, based upon the chosen time period and user-agent(s). These can both be configured in the top right hand corner. Path – The directory path. Num Events – The total number of events for the directory path. Average Bytes – The average size in bytes of all log events for the directory. Average Response Time (ms) – The length of time taken (measured in milliseconds) to download URLs in the directory on average. Googlebot – The total number of Googlebot events for the directory. Bingbot – The total number of Bingbot events for the directory. Googlebot Mobile – The total number of Googlebot Mobile events for the directory. Googlebot Smartphone – The total number of Googlebot Smartphone events for the directory. Yandex – The total number of Yandex events for the directory. Baidu – The total number of Baidu events for the directory. 1XX – The total number of 1XX events in the directory. 2XX – The total number of 2XX events in the directory. 3XX – The total number of 3XX events in the directory. 4XX – The total number of 4XX events in the directory. 5XX – The total number of 5XX events in the directory. The IPs tab aggregates data from the log file for every IP discovered, based upon the chosen time period, user-agent(s) and project type (‘Bot only’, or ‘All’). Remote Host – The IP address of the events. Unique URLs – The number of unique URLs requested by the IP. Num Events – The total number of events for the IP. Average Bytes – The average size in bytes of all log events for the IP. Average Response Time (ms) – The length of time taken (measured in milliseconds) to download URLs on average for the IP. 1XX – The total number of 1XX events for the IP. 2XX – The total number of 2XX events for the IP. 3XX – The total number of 3XX events for the IP. 4XX – The total number of 4XX events for the IP. 5XX – The total number of 5XX events for the IP. 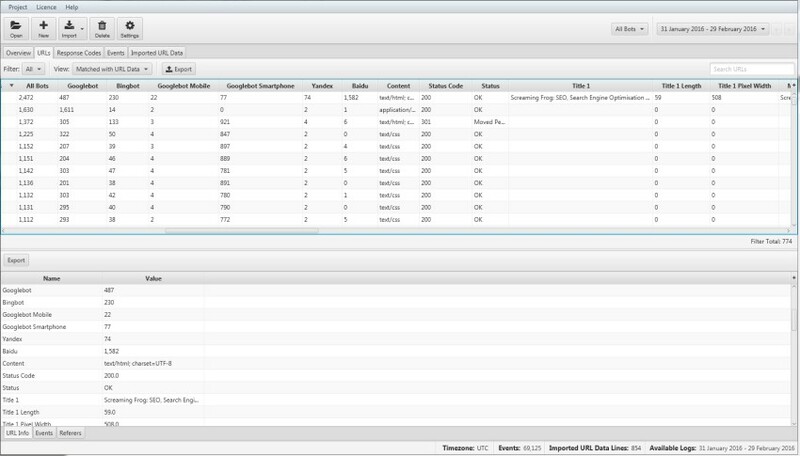 The ‘events’ tab shows you the raw events from the log file, with every attribute available. Please bare in mind, if you’re analysing 10 million log file events, this view will contain 10 million events and take some time to generate. Filters, sorting and searching will also take more time. Time Taken(ms). ms stands for milliseconds. There are 1000 milliseconds in a second. So 500 milliseconds is half a second etc. The ‘Imported URL Data’ tab allows you to import CSVs or Excel files with any data which have a ‘URLs’ heading and column. 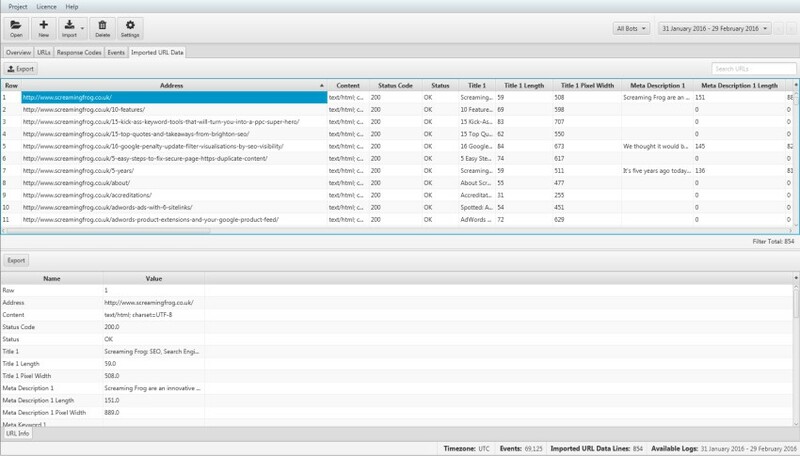 For example, you can import crawl data, URLs from a sitemap or a ‘top pages’ export from Majestic or OSE for example. You can import multiple files and data will be matched up automatically against URLs, similar to VLOOKUP.